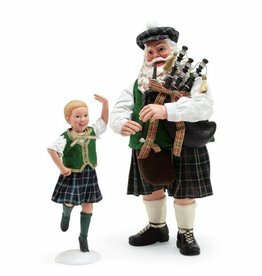 Our Irish Santa is accomanying a Celtic Dancer with his festive set of bagpipes! 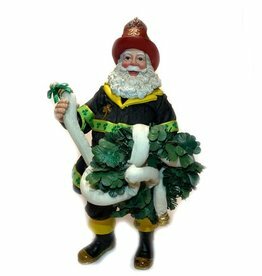 Measures 5.5x10", this Scottish Santa features a Royal Stewart Coat with Fur Trim! Holding a big bag of toys, he guides his way with a lantern! 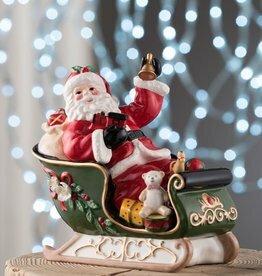 For that very special time of the year, when you want to show how much you care, Belleek Living have designed an exclusive Christmas Collection, full of unique gift ideas. 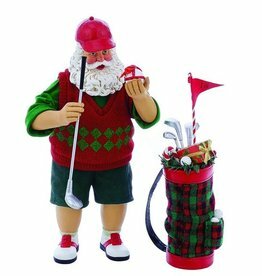 This 10” Fabriche’ “Golf Vacation” Santa makes a fun and festive addition to any holidya decor! 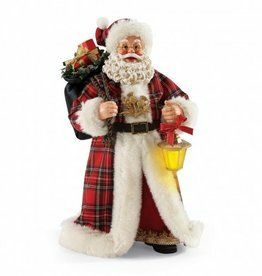 Par-fect for golfers and golf fans, Santa comes with his own green & red tartan golf bag! 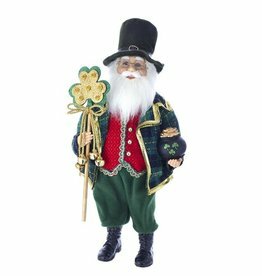 Released in 2014, this Irish Santa from Possible Dreams measures 10in H x 5.5in W x 6.5in L.
Santa arrives at your door carrying a very special Celtic Christmas hostess gift, two snowy white poinsettias. 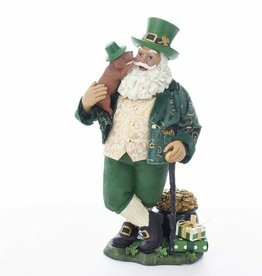 Deck the halls this holiday season and show your Irish pride with the Irish Santa Figurine. 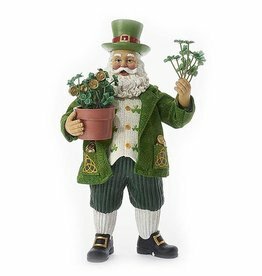 This Irish Santa would make a delightful addition you Irish decor! 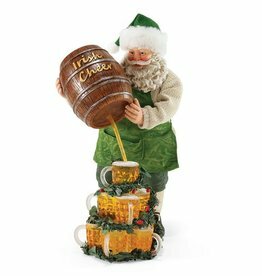 Features an Irish Santa pouring his keg of Irish Cheer into some stacked up beer mugs! 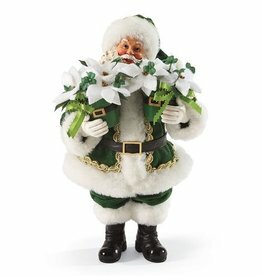 Measuring 10”, our Dancing Irish Santa features shamrock detailing. 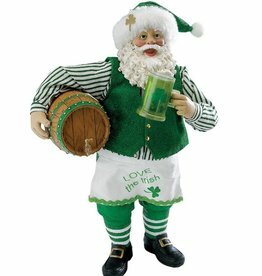 Our Irish Santa measures 11.75” tall. 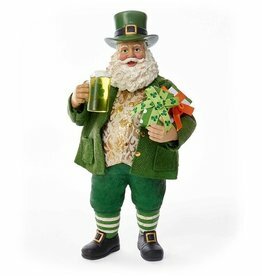 He is holding an armfull of Irish Gifts and has an Irish mug of beer! 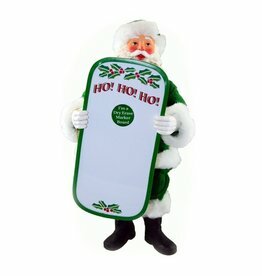 Our 10" Collectible Irish Santa comes with a dry erase board to leave holiday messages! The Celtic bookmark holds the spot where you can read the phrase: Until we meet again may God hold you in the palm of his hand. 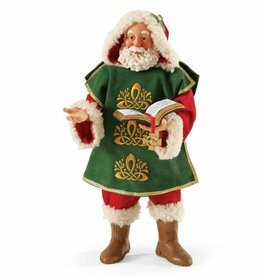 Wind-up Musical Irish Santa plays "When Irish Eyes Are Smiling!" 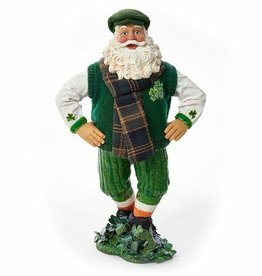 Features Santa holding a big pot of shamrocks, as well as shamrock detailing on his vest, and Celtic Knot detailing on his sweater! 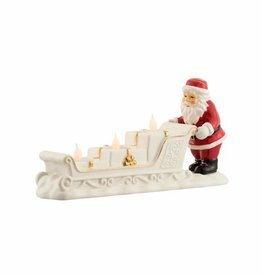 Glowing with fiber optic illumination, this happy Santa will delight all eyes whether on the tree or tabletop!